Three parcels, one single identity. One “high altitude” parcel on a wide plateau that culminates at 316 metres altitude, inclined towards the south with a soil of beige marl that brings density and freshness. A second parcel deep in a small valley oriented south at 250 metres altitude. And finally the third, sheltered from the wind in the heart of the village, confers maturity and warmth. The choice was to make this a wine with a pure grape profile, without technological intervention. So the vines are cultivated without herbicides, but by tilling the soils and natural grassing over. Strict yield control is imposed by nature, but also by the altitude of the parcels. At over 300 metres altitude our northern climate does not allow for heavily charged vines. It is therefore on average 40 Hl/ha that is harvested. Our method of winemaking, after severe sorting, is in classic Burgundy style, with cap punching and long vatting for around 12 to 15 days. The maturing period of 12 months takes place in barrel, with a maximum of 20% new barrels, to respect the purity of the grapes and the aromatic freshness of Pinot Noir. Just a few hectolitres are aged in vats. The wine is lightly filtered before bottling. It is therefore a pure Burgundy Pinot Noir that you will experience which, subject to the vagaries of the climate, will be the pure expression of its vintage. Chardonnay: a selection of early ripening plants of medium yield. Deep soils on the plains bordering the AOC Mercurey appellation, with good sunshine exposure. Cultivated using reasoned viticultural methods with no use of herbicides, only tilling of the soil. Yields are controlled by disbudding and green harvesting if necessary. The grapes are hand-picked directly into small crates, then pressed in whole bunches. Cold settling at 10° for 24 hours. Three quarters of the wine is matured in barrel and a quarter in vats for 10 to 11 months, after which it is blended and lightly fined. Conceived as a wine which is deliberately accessible, for aperitifs and simple meals. A nose of white fleshed and exotic fruit such as grapefruit, and good volume in the mouth. Perfect for impromptu aperitifs that extend into simple meals. Dense, deep and fairly fertile soils at the foot of the slopes. Hand-picked into small crates. The grapes are sorted after picking then totally destemmed. Cold pre-fermentation maceration for 1 to 2 days then 11 days in the vat with regular cap punching and pumping over. Matured partially in vat (15 to 20%), and the remainder in barrel, of which 10% are new, for 11 months. The wine is then blended, and bottled three months after it has clarified naturally. A deliciously succulent Pinot Noir with typical Burgundy aromas of fresh strawberry and cherry. Perfect for roast meats or delicately flavoured casseroles. Altitude 300 metres with a west south-west orientation. A terroir par excellence for Chardonnay. Numerous limestone outcrops at the base of the slopes. Half-way up the limestone breaks up and mixes with clay and at the summit gives way to beige marl. Vines cultivated using reasoned methods with no use of herbicides, only tilling of the soil. Yields are controlled by disbudding and green harvesting if necessary. Hand picking. Grapes pressed in whole bunches. Static settling for 24 hours. Fermented in barrels of which 25% are new. Indigenous yeasts only. Alcoholic fermentation often finishes very late. Aged in lees with regular stirring for 11 months, then the wine is bottled after fining. A complex nose, all at once floral and mineral, with hints of citrus. Delicately acidulous and fresh with a touch of salinity. Hillsides of beige marl at an altitude of 300 metres facing south south-east, punctuated with small ridges of limestone. There are two parcels. In the oldest of them the vines are 40 years old and in the other, 30. Hand-picked into small crates. The grapes are sorted on arrival, and 100% destemmed. Pre-fermentation maceration at 15°C for three days. Vatting for 15 days with moderate cap punching and pumping over for a gentle extraction. Matured for 12 months in barrels of which 25% are new. Here Pinot Noir expresses itself with minerality and extreme aromatic precision, purity and balance. Superb texture with a slightly saline finish. The Domaine made their first Cremant in 2004. From the very first year we chose to undertake the entire process ourselves, from picking the grapes to what is known as the “prise de mousse”, or when the effervescence is formed. The disgorgement was entrusted to a friend who is a practised professional in Rully. We also faced another choice! For the Cremant to find its place in our production, it needed to have real personality. We therefore decided upon a Blanc de Noir Cremant, that is, a white sparkling wine made from black Pinot Noir grapes. And in 2008, specific packaging was designed to underline this individuality. The grapes are harvested at Mercurey from a parcel of red Bourgogne Côte Chalonnaise. The Burgundy Pinot Noir grapes that are pressed and vinified at low temperatures (14°) with the greatest of care give our Cremant immense volume and delicate red fruit aromas. Its effervescence is light and fine. With very little dosage at disgorgement, it conserves purity and freshness, with a beautifully light touch. Simplement was born out of the desire to introduce Mercurey to new palates: those returning to the taste of Burgundy, those newly inspired, or young adults in search of discoveries. And so we wanted this wine to be pleasing and accessible from both a taste and price point of view. Our desire was for it to allow a wide range of people to discover, or rediscover, this marvellous terroir which is Mercurey. « Simplement » springs from the hillsides of Mercurey. Made with the same care and attention as all the other wines (harvested into crates, grape sorting, barrel ageing…), but without particular emphasis on extraction, and little intervention. Round, delicate and fruity, with a lightly toasted touch. Perfect for the neophyte or for everyday pleasures. Chardonnay – from selected vines producing small grapes on very small, loosely structured and well aerated bunches. Altitude 300 – 325 metres. Orange coloured limestone clay soils sprinkled with small fossils, oriented south south-west. The altitude and the orientation make this a terroir that comes to maturity fairly slowly. Patience is required to obtain full ripeness. Picked by hand into small crates. Pressed in whole bunches in a pneumatic press. Cold settling at 12 – 14°C for between 12 and 24 hours before being transferred into barrels. Fermentation in barrels, 30% new barrels, 30% one wine and 30% two wines. Matured for 12 months in barrel with weekly stirring until malolactic fermentation is complete. Bottled after fining and light filtering if necessary. Very aromatic, mingling floral and citrus notes with a hint of minerality. Fresh and precise in the mouth. Serve moderately chilled, at around 12-13°C. Ideal as an aperitif, and excellent with all fish dishes or white meats. Like all great white Burgundies, it can be paired to advantage with local dishes such as blanquette, and regional cheeses. This Mercurey Premier Cru is composed of 4 parcels for a total of 1.2 hectares. This heterogeneity of plants of different ages and origins makes for an extremely interesting ensemble. Pinot Noir from diverse selections. Classically limestone clay, a combination of meagre, marl soils on the upper slopes and richer, more complex soils that start mid-way down. Full south orientation. An average of 30 years old. Guyot pruned – Number of shoots limited to a maximum of 6 per vine. Vines cultivated using reasoned methods with no use of herbicides, only tilling of the soil. The grapes are hand-picked into small crates and sorted. 100% destemmed. Cold pre-fermentation maceration for 3 to 5 days at 12°C. Vatting for 15 days with cap punching and pumping over. The rhythm and frequency are determined by the characteristics of each vintage. 100% barrel aged, of which 20% are new, for a total of 12 to 15 months before bottling preceded by a light filtering if necessary. Purplish carmine in colour. Complex nose of berry fruit such as blackcurrant and blackberry. The palate is precise and succulent, with a lovely acidulous, fruity finish. Best opened 2 to 3 hours before serving. This delicious, fruity wine will accompany to perfection all types of meat, cheeses and exotic dishes. Around 5 to 8 years. Pinot Noir: A superb selection of small berry Pinot Noir. A limestone clay terroir at 225 metres altitude in the heart of the village, which enjoys exceptional sunshine exposure thanks to its orientation full south. Naturally protected from the prevailing winds, it allows the grapes to always attain perfect maturity. Cold pre-fermentation maceration for 5 or 6 days, followed by vatting for 12 days with cap punching and pumping over 2 to 3 times daily. The wine is transferred to barrels after settling for two weeks. Matured in barrels of which 20% are new. 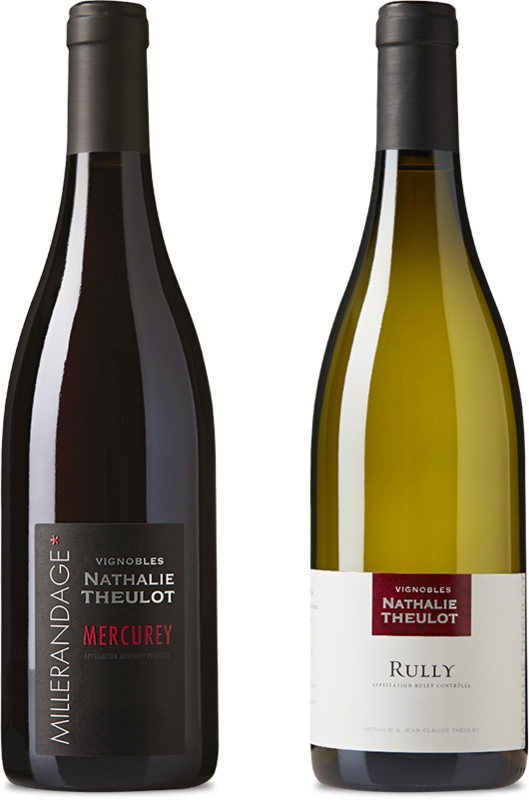 Half way between a red Mercurey Vieilles Vignes and a red Mercurey Premier CRU, the complexity and the finesse of the wines produced in this terroir will no doubt see them recognised as a new Premier CRU when the Mercurey classifications are reviewed. This parcel, which forms an ensemble with a forest and a small hunting lodge, is an emblematic place within the Mercurey appellation. It was acquired by my grandfather at the beginning of the fifties, and will forever be associated with the name of Emile Juillot. This terroir, with its different geological strata, allows one of the great white wines of the appellation to be produced on its upper slopes. At 340 metres altitude, facing south, this parcel dominates the village of Mercurey. In these soils of beige marl, with numerous outcrops of limestone rock, Chardonnay finds its conditions of predilection. In the shelter of the south-facing hills, protected from the cold winds from the north, and benefitting from optimum sunshine, the grapes always attain exceptional maturity here. Grapes are picked by hand into 25kg crates. They are pressed in whole bunches and the must is cold settled for 24 hours at 10°C before being transferred into barrels. The wines are fermented and matured in barrels of which 30% are new, for a total of 11 months, with weekly stirring until the malolactic fermentation is complete. The wines are fined and lightly filtered before bottling. An extraordinary aromatic expression with a “Rhone” accent in this Chardonnay that flirts with notes of viognier. A rich and complex wine. This terroir dedicated to the culture of Pinot Noir, with its different geological strata, allows one of the great wines of the appellation to be produced on its upper slopes. Pinot Noir from two distinct selections. One confers finesse and complexity and the other, colour and structure. Limestone of Oolite and Jurassic origin with a distinctive red tint. The parcel sits at an altitude of around 300 metres and faces south-east. This orientation, associated with the steepness of the slope, allow the vines to benefit from excellent sunshine exposure. Parcel planted in 1979 and 1980. Two types of pruning are applied here: Guyot for the more delicate plants and Cordon de Royat for the more vigorous ones. We use reasoned viticultural methods with no use of herbicides, only tilling of the soil. Yields are controlled by disbudding and green harvesting if necessary. The grapes are hand-picked into small crates and sorted before being 100% destemmed. Cold pre-fermentation maceration for 5 to 6 days at 10 – 12°C. Vatting lasts 15 days with cap punching and pumping over, with the rhythm being determined by the characteristics of each vintage. Matured 100% in barrels of which 25% are new, for a total of 12 to 15 months. The wine is then bottled after a light filtering if necessary. Although perfect for the classic Burgundy pairings, a contemporary or more exotic touch will highlight all the qualities of this wine. Its freshness and tonus will go perfectly with white meats and certain fish dishes. Fully south facing slopes at an altitude of 275 metres. Hand-picked into small crates. Sorted on sorting tables. Fairly long vatting of 15 days including 4 days of pre-fermentation maceration at 12°C. The duration is adapted to the structure of each vintage. Matured for 14 months including 12 months in barrel, of which 25% are new. Bottled a few months after blending, after light filtering if necessary. All the passion and the power of this great terroir. Blackberry and blueberry, opulence and volume, with incredibly soft tannins. Open and allow to breathe for a few hours at room temperature before serving. Ideal with beef, or excellent with exotic or lightly spicy cuisine. Fully south facing terroir of limestone clay. The grapes are hand-picked into 30kg crates. They are then sorted and pressed whole. After a light cold settling (10°C) the must is fermented for 75% in vats and 25% in barrels, of which 20% are new. These proportions are designed to preserve all the typical characteristics of Chardonnay on its limestone terroir, whilst at the same time mellowing the aromas and increasing complexity by means of partial barrel ageing. Fermentation is without added yeast, at a temperature of 18 – 20°C (for the vats). Bottled after 12 months maturing, following a simple racking operation and a very light filtering to clarify the wine. A wine characterised by minerality and aromatic purity. Aromas of exotic fruit and white-fleshed fruit. Around 3 to 5 years. Depending on the vintage and the generosity of nature, different Mercurey Premier Cru terroirs will enter into the composition of this micro-cuvee. Whilst the base remains unchanged from one year to the next (Mercurey Premier Cru « Les Saumonts » and Mercurey Premier Cru « Clos Tonnerre »), each vintage will see its personality enriched by one or more additional terroirs. This cuvee is the perfect demonstration that all these tiny amounts, that would be difficult to vinify in isolation, can unite to create a Mercurey Premier Cru of multiple qualities. And whatever its composition may be, it is guaranteed to possess the elegance, the complexity and the richness of this fabulous appellation, Mercurey Premier Cru. When harvest volumes are low, we buy top quality grapes in all confidence from our fellow winegrowers. That allows us to meet demand and at the same time propose new cuvees to you. A beautiful fresh, luscious Mercurey vinified by us. The minerality of a great “white” terroir, and the complexity of a prestigious appellation.